What they are, where they are and what can be done about them? Incidences of elevated radium content have been found in Maryland, Illinois, Wisconsin, Oklahoma and the list goes on. The simple reality is that when you work in the field of water and wastewater management and operations, you will, at some point, have a partner community that is faced with elevated levels of radium in their water supply. Understanding its causes and possible treatment methods are important tools to have as you advise and guide your community partners. PeopleService has worked with cities facing this challenge and is prepared to help your city with the best advice possible. Our team is knowledgeable about all of the approved methods for eliminating elevated radium content. The first step is understanding the problem and the best options available to ensure the safety of your water supply. Radium is a naturally occurring radioactive element and known carcinogen that usually is present at low levels in rocks, soils and groundwater. Surface water is typically low in radium but groundwater can contain high levels of radium depending on local geology. Deep bedrock aquifers used for drinking water sometimes contain levels of Ra-226 and Ra-228 that exceed health-based regulatory standards. The presence of radium in groundwater is largely the result of minerals dissolving from weathered rocks and soils. Radium presents itself in the form of several isotopes. These include radium-224 (Ra-224), radium-226 (Ra-226) and radium-228 (Ra-228). Communities that have been forced to drill deeper wells to tap an aquifer often encounter higher radium content because contamination tends to increase the deeper a well is drilled. The U.S. Environmental Protection Agency (USEPA) has established maximum contaminant level (MCL) for combined Ra-226 plus Ra-228 of 5 picocuries per liter (pCi/L) for public water supplies. USEPA in coordination with U.S. Geological Survey is evaluating the occurrence and potential guidance required for Ra-224 as noted in the provisions of the Radionuclide Rule of 2000. Protecting the communities and people we serve is paramount and the importance of testing and accurately reporting are key to preventing public exposure. We know there are acceptable and proven methods for dealing with radium found in the water supply. Radium can be removed from potable water and brought to compliant levels using any of several methods and working systems can be found that use ion exchange or adsorption. The process of reverse osmosis also removes radium. As with any contaminant removed through ion exchange, radium is adsorbed onto a resin bed. Once radium is removed from the resin through regeneration, it is concentrated in the brine. Liquid wastes from radium removal are allowed to be discharged to a sanitary sewer, provided the levels are less than federal, state and local limits. If the brine exceeds these levels, radium must be removed to compliant levels before the brine can be discharged to a sanitary sewer. This can be accomplished with the addition of an adsorption system to remove the radium from the brine, which may then be reused or discharged. Radium can be removed from potable water through adsorption, a National Science Foundation approved resin has been developed that can be used to treat brine or used directly on the raw water for radium removal. In a direct adsorption process, water passes through a resin bed where radium is adsorbed to a resin. Since the radium is permanently adsorbed, no regeneration is required and there is no liquid waste discharge. Typically, several years pass before the media requires replacement, at which time spent resin is disposed as solid low-level radioactive waste in accordance with all applicable regulations. Care must be taken for the monitoring of radium levels and the appropriate disposal of spent resin, as solid wastes must go to an approved low-level radioactive waste disposal site. Reverse osmosis can remove many inorganic contaminants very effectively, including heavy metals and radionuclides such as radium and uranium. In fact, reverse osmosis systems have demonstrated an ability to remove 87 to 98% of the radium present in drinking water. Similar elimination can be achieved for alpha particle activity and total beta and photon emitter activity. Reverse osmosis systems offer added benefits by removing many other contaminants. All the methods described above are viable for removing radium from potable water, and for each method, radium becomes concentrated in either liquid or solid waste. Selection of an optimal removal method is typically site-specific, and the process selection centers on waste disposal issues, the presence of other contaminants, capital cost, and operational cost. Each city, township, district or community will have to assess their specific situation and the costs involved to best find the solution that is right for them. Interested in touring a working RO plant? Contact PeopleService’s President Chad Meyer for information. 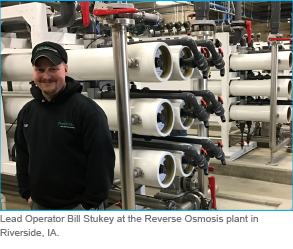 The Reverse Osmosis plant PeopleService manages in Riverside, Iowa is run by lead operator Bill Stukey and is a great example of a modern reverse osmosis facility. Bill would be happy to explain the process, benefits and day-to-day operations if you have questions.